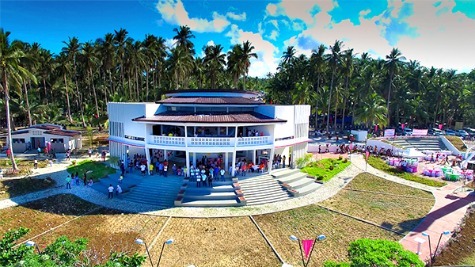 The provincial government and the Department of Tourism have opened a new tourism landmark in the town of Caraga, Davao Oriental that will further boost the tourism activities in the province. Davao Oriental Gov. Corazon Malanyaon and DOT-11 Regional Director Roberto Alabado III led the inauguration of the Pusan Point Science Discovery Center and Eco-Park in Barangay Santiago, Caraga on Friday afternoon. Pusan Point is the place where the first rays of the sun can be witnessed in the country as it is strategically located in the easternmost portion of the Philippines facing the vast Pacific Ocean. Pusan Point is located in Barangay Santiago, Caraga, more or less two hours of travel or 82 kilometers from the province’s capital, Mati City, which is a three-and-half-hour ride from Davao City. During the turn of the 21st century, or on the eve of the year 2000, hundreds of nature lovers, environmentalists, tourists and other enthusiasts stormed Pusan Point to witness the first sunrise of the millennium. Dubbed as “First Light, First Sight,” the said activity was not very successful as dark clouds covered the eastern horizon on the first hours of Jan. 1, 2000. “People from different parts of the country and even foreign tourists converged here to celebrate and watch the first millennium sunrise,” said Governor Malanyaon in her message during the inauguration program. “This is Pusan Point where the sun shines first. Davao Oriental is located in the easternmost part of this country. This place is also historic because Caraga is the oldest town in Mindanao,” the governor added. The town of Caraga used to be the bastion of Spanish colonization and the cradle of Christianity in eastern Mindanao during the period. The town was established in 1861 where the Spaniards built fortifications and other edifices. The Jesuits, in 1871 came to the area and continued the missionary works of the Spanish Augustinian priests. They built a church made out of stone and durable woods, a landmark that still stands today in Caraga. Last Friday’s activity was the “unveiling to the people of the province and the rest of the world another tourism landmark located in this historic province,” Malanyaon pointed out. The present leadership of the province fortified Caraga’s bid to become one of the tourism destinations in the region and the country. “We have the natural structures and rich culture. We have what it takes in declaring in coming days Caraga as a cultural heritage park,” the governor said, as he urged the incoming Gov. Nelson Dayanghirang to work for it and set another landmark for the province. Dayanghirang, together with Caraga Mayor Alicia Mori and other top provincial and municipal officials, also graced the occasion. Pusan Point is now accessible with the opening of the concrete road from the main national highway toward the new tourism site. Formally opened last Friday were the two-story building that houses the lobby, reception, administration office, a souvenir shop, coffee shop and the museum called the Pusan Point Science Discovery Center. The museum is filled with interactive exhibits that will allow users to be more engaged in science that is divided into 10 sections. These sections include the hydrosphere section, lithosphere section, atmosphere section, space section, planetarium, galaxy walk, cosmic light station, energy section, technology section, and chemistry section. Another new feature at the Pusan Point is the kiosk that faces the vast Pacific Ocean, a site that is best to watch the first rays of sunlight in the morning. The kiosk will also serve as a meditation area where guests will have time to reflect, meditate while appreciating the gifts of nature as seen from said vantage point. Between the two-story building and the kiosk lies the 200-square meter swimming pool fully equipped with outdoor toilets, grills and shower areas. Pusan Point now also has an outdoor amphitheater with a 100-seat capacity that can cater to important events and occasions. Last Friday’s opening ceremony was held in the area under the newly-completed sundial that served as the centerpiece of the park. Surrounding the amphitheater are spaces suitable for camping, a promenade, jogging area and pathways for walking. With the full development of features and amenities in Pusan Point, one can really say that a stay for a day or two in the area would be fun-filled, educational and memorable.